There's no better way to make the most of the season's rare hazy sunny days and the city's lush, green, meandering parks and gardens than with a spot of traditional summer picnicking. So, read on to discover LondonTown.com's pick of the best spots for do-it-yourself al fresco dining, along with each areas best delis. Cosy spots are plentiful at this out of town park. Pretty Holland Park is the ideal location for those wanting to escape the clamour of the city but who don't want to travel too far out of the centre. Tucked away in one of London's most elegant districts, it offers small, cosy grassy knolls, cooling woodland glades, wild ponds, an open expanse for games and general frolicking, playgrounds for older and younger children and a cafe - just in case you run out of picnic food. Small, but perfectly formed, this lovely park is perfect for an intimate picnic or romantic stroll. There are beautiful woodland trails, manicured lawns and formal gardens, the Kyoto Japanese Garden with its resident Coi, and a fantastic ice-cream stand in the middle. Holland Park used to be a private estate, and the former ballroom of Holland House is now the stylish Belvedere restaurant. In summer open air opera concerts are held in the grounds. Spending the day here, lazily munching on picnic snacks as the sun sets and the wild foxes start to gather to pick up any leftover crumbs, is the perfect summer pursuit. The largest public square in London, Lincoln's Inn Fields has a rich and varied history. A thriving rich recreation ground that's ideal for summer grazing. 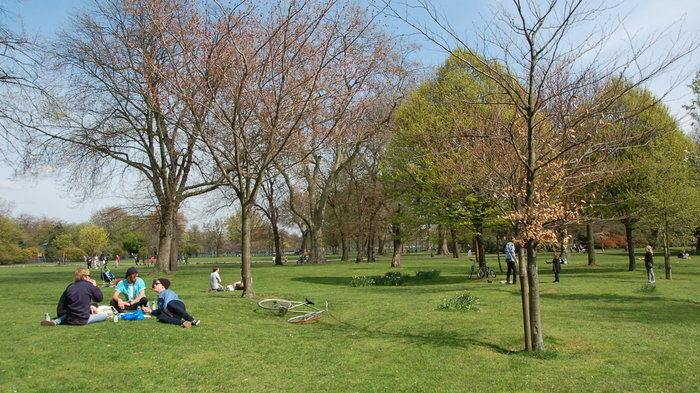 Located in a bustling, regenerated area of east London, London Fields park has been transformed from a neglected area of common ground into a thriving rich recreation ground. It now contains a wonderful heated lido(one of the few heated outdoor pools in London), cricket pitch, a small BMX track, two tennis courts and a children's play area. To book a tennis court call Hackney City Tennis Clubs on 020 7254 4235. Cricket has been played on the park since as early as 1802 and the cricket strip on London Fields still hosts competitive games throughout the summer (late April to mid September). If you want to get in touch with London Fields Cricket Club, email londonfieldscc@gmail.com, alternatively, the cricket pitch can be booked by calling 020 8985 8206. The park is hugely popular spot on weekends, especially in summer when it gets crammed with young families enjoying barbeques and impromptu frisbee games. Parliament Hill is the gateway to huge, sprawling Hampstead Heath and offers stunning views over London. With summer, come long, drawn-out summer evenings. A late afternoon, evening or after-work picnic is a delightful way to end the day. If this is what you're after, head for Parliament Hill, on the edge of idyllic Hampstead Heath. Find a spot on the brow of the hill, set out your blanket, open a bottle of wine and drink in the spectacular view of London as the sun sets gently on the horizon. If you're in need of cooling down you can even indulge in a refreshing dip in one of the heath's many swimming ponds. Alternatively, make a day of it and intersperse your picnic with a good old ramble, taking in Kenwood House as you clamber through long grass, over hilly mounds and among woody copses. There are a number of good pubs dotted along the edge of the heath (Spaniards Inn, The Flask, the Magdala, and The Holly Bush) so wherever you emerge you can end your picnic with a soothing pint. Small garden in the heart of the West End, run by volunteers and local residents. In the shadow of both Centrepoint and St Giles-in-the-Fields Church, hidden from most tourists and residents alike, lies this beautiful West End garden. Originally a car park, this small city centre idyll is now a tranquil haven for wildlife. Frogs and tadpoles saturate the pond, while birds of all shapes and sizes frequent the trees, nest boxes and feeders. Privately managed by a team of loyal volunteers who have consistently battled against threats of closure, this garden feels unlike another in London. It has a warm, friendly, intimate feel to it part of the local community, you will often come across volunteers working away at developing and nurturing the space. This is very much a living garden a pretty park with real heart and soul. If you're in the area venture behind the concrete and discover Phoenix Gardens as it continues to rise from the ashes. The largest Royal Park in London, complete with herds of majestic fallow deer. Only 30 minutes or so from central London, Richmond Park is English countryside as you might imagine it depicted in a glossily illustrated Robin Hood story: mighty oaks, a thousand years old, dense forests, dinky copses, rolling hills, majestic fallow deer and burrowing rabbits. Covering almost 2,500 acres, Richmond Park is the largest Royal Park in London. With such a large space its hard to know where to start when visiting. A tall brick wall surrounds the entire park so you need to first work out which gate you are going to use to enter and then plan your route from there. The best way to enter is via Richmond Gate, heading first for King Henry's Mound. The park's position on the edge of town affords it some fantastic panoramas of the capital King Henry VIII's Mound is the place to head for uninterrupted views all the way to St Paul's Cathedral. Wherever you chose to roam via the ponds and Deer Park or circumventing the many lodges, make sure you end up at the Isabella Plantation. Heavily wooded and wholly organic, the Isabella Plantation bursts with massive mounds of azaleas, rhododendrons, camellias and magnolias and really is truly magical. Apart from a couple of roads running around the edge of the park (traffic is highly regulated and, for the most part, unassuming) the park has changed little since the reign of Charles I. Responsible for parks enclosure and the introduction of deer, Charles I sought sanctuary in Richmond during the plague. These days the park performs much the same function, offering a calming sanctuary from the pressures of city life. London's secret park is the perfect place to while away a sunny afternoon. One of London's best kept secrets, Victoria Park is a fantastic place to spend an afternoon. Inside the park's boundaries countless varieties of trees stripe the skyline: oaks, horse chestnuts, cherries, hawthorns and even Kentucky coffee trees. The park is split in two by Grove Road. The smaller, western section contains the most picturesque of its lakes with a fully functioning fountain and the imposing Dogs of Alcibiades, two snarling sculptures. Retreat to the quiet of the Old English Garden, a floral haven brimming with flowers and shrubs. Have a peek into the deer enclosure and let the kids run off some energy in the children's playground. The city's first public park opened in the East End in 1845 after a local MP presented Queen Victoria with a petition of 30,000 signatures. It was envisaged as a Regent's Park of the east and originally had its own Speaker's Corner. The Victorians saw parks as instruments of moral and physical improvement, especially for the working classes. Sanitary reformer William Farr believed the use of parks would significantly boost life expectancy. Why not boost your constitution and have an enjoyable day out at the same time, as you explore the many attractions of this glorious park. From cheap budget hotels to luxury 5 star hotels see our special offers for hotels, including Every Hotel Piccadilly from 58% off.